Exciting events filled the Saturday schedule. We started the morning with a message from Charleeda for the congregation. After lunch we shared a study of “Adorned by God” with the women. Immediately following our time with the women, we heard joyous singing outside. The baptisms had begun! We gather to join singing and celebrate baptisms. So many believers lined up to be baptized that the pastors decided that it must be done three at a time in order to finish before dark! Three pastors in the baptismal at once. 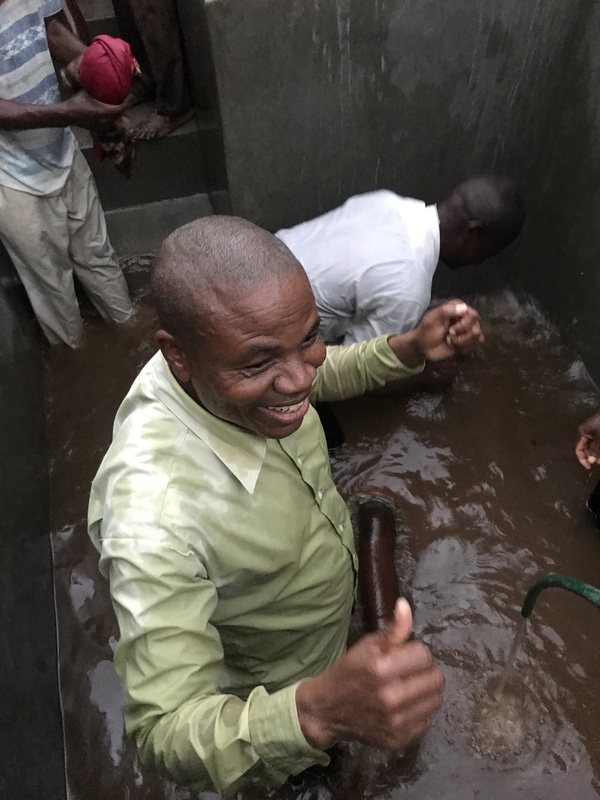 Pastors from all over Malawi and Mozambique brought new believers to be baptized at the conference. As I mentioned in a previous blog, they can no longer baptize in the river because of the crocodiles. As more and more were baptized, the singing increased. Pastor Chilemba greets the next in line! We were elated to see so many taking this step of obedience, getting baptized is an experience they will never forget. 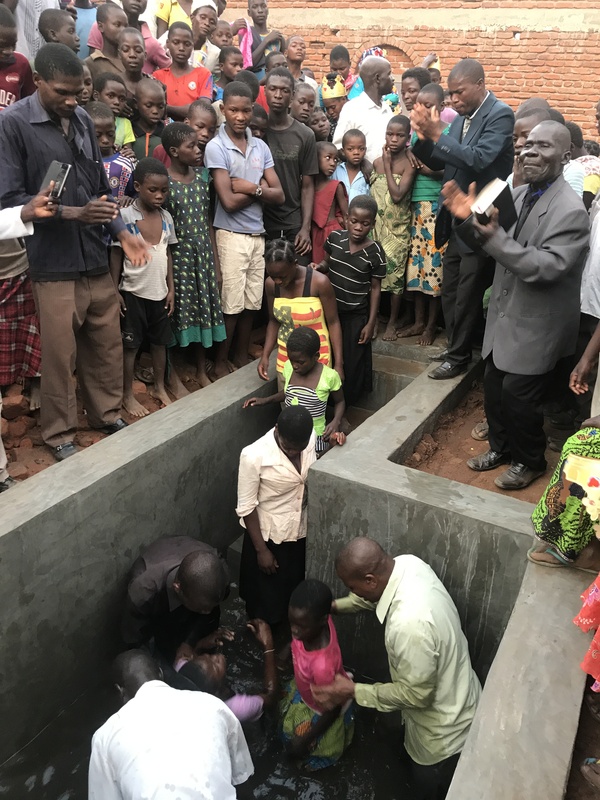 Thanks to all our faithful supporters, the baptismal became a reality. Thanks be to God the faithful came to show their commitment to Him. 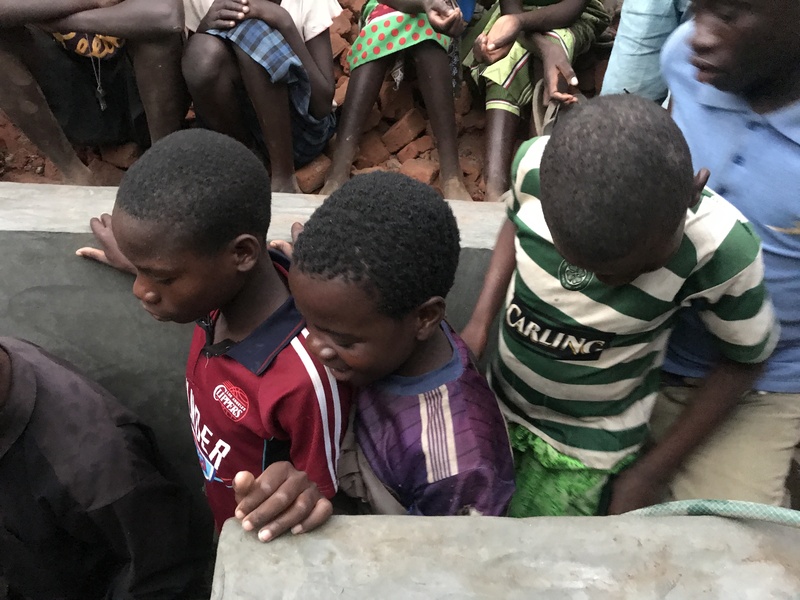 Young boys eager for their baptism! Praise be to God! 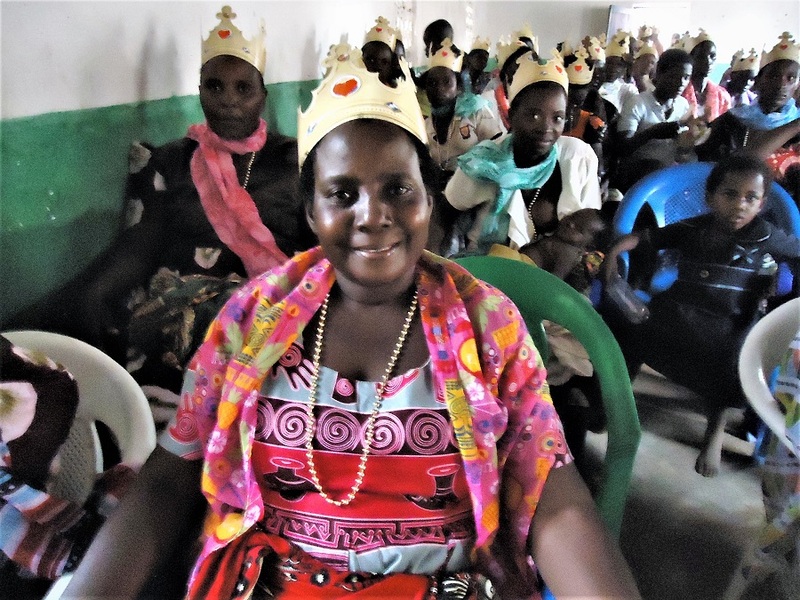 Over one hundred fifty took this important step in their faith. The rest of the day was filled with music, singing and praising the Lord! Saturday afternoon finally arrived. 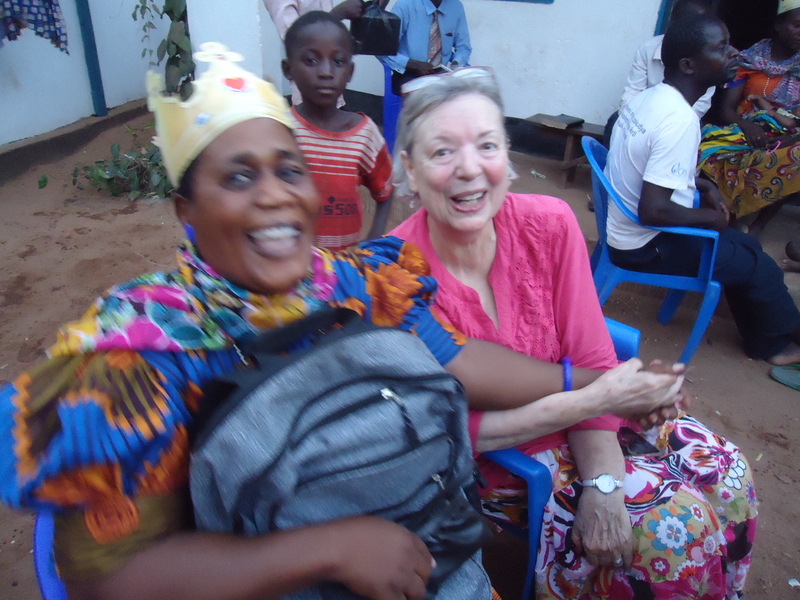 We had been looking forward to spending time with the women of the church since our arrival. 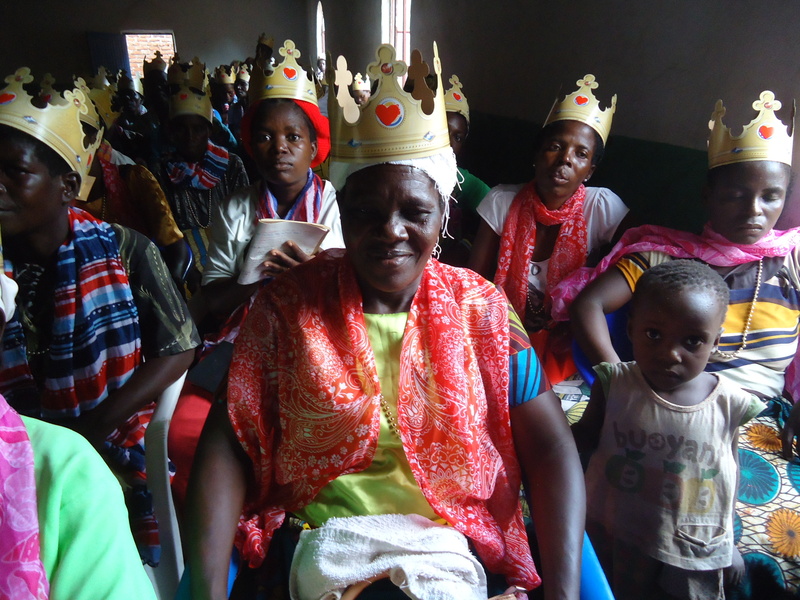 We set up the picture of a queen and described how God adorns us as queens. Our translator was Fiona. 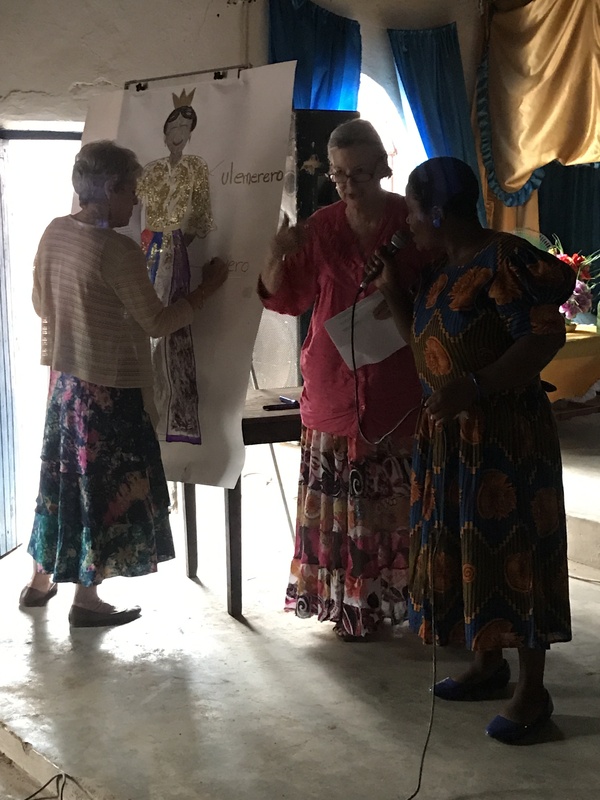 Charleeda makes notes on our drawing of a queen while I explain the colors on the gown. 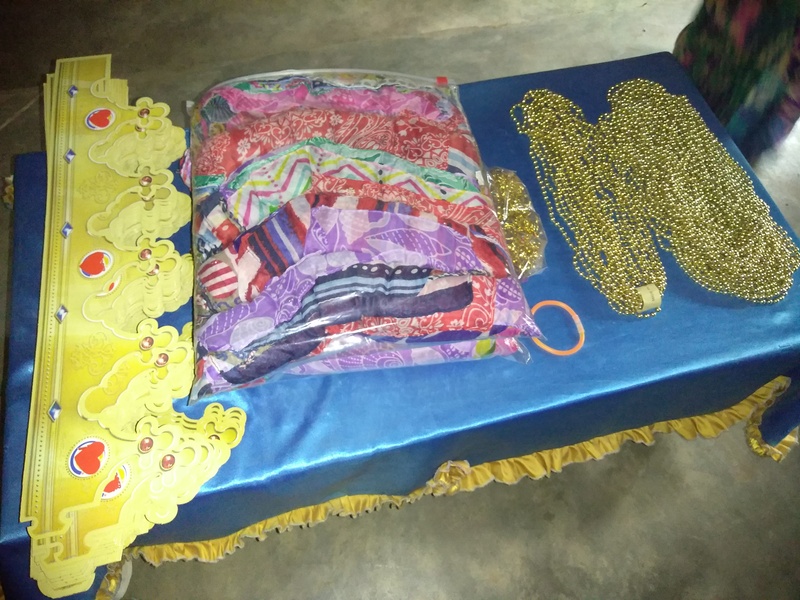 Items used to adorn the women. The women on one side of the room. Thanks to Burger King for giving us all those crowns! Mama Chilemba, on the other side of the room, smiles for the camera. The women treasured their gifts. Some of the crowns were seen all the next week! The scarves were donated by our faithful supporters. They were treasured just as much as the crowns, necklaces, and the rings. We were supposed to have 150 women, but after I gave away the 170th scarf with women still in line, I knew we had at least 200 women. Praise God, what a blessing! 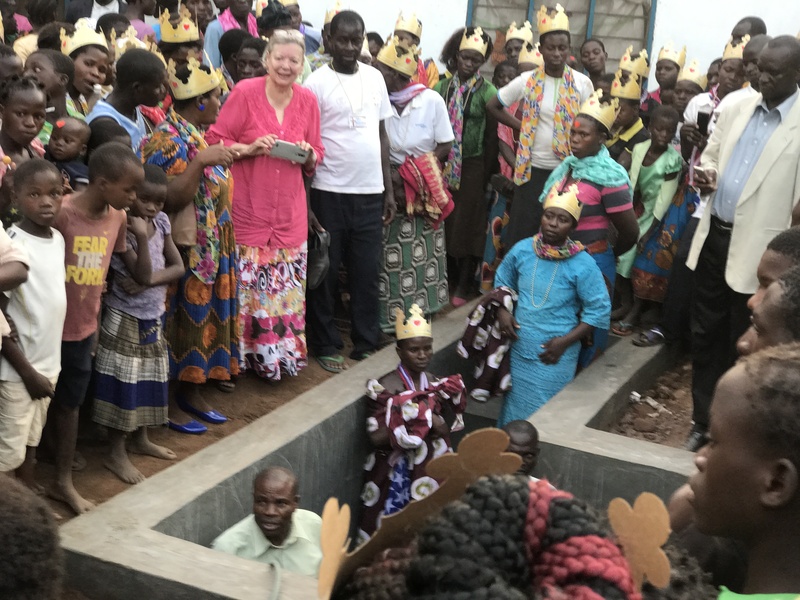 The church conference was starting on Friday night, and the baptisms were planned for Saturday. We wondered how on earth they would get it done by then. Not only that, with such high temperatures and high humidity, would the concrete get dry? 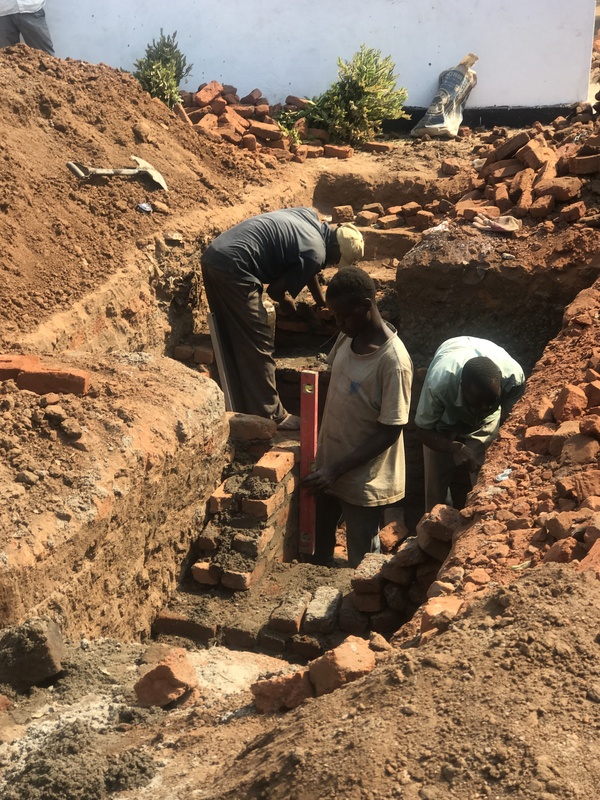 Starting to lay the brick foundation. By the middle of the week the baptism looked like this. Would it be ready in time? Midweek the baptism looks good, but time is passing quickly. Thursday morning all the brick was in place. 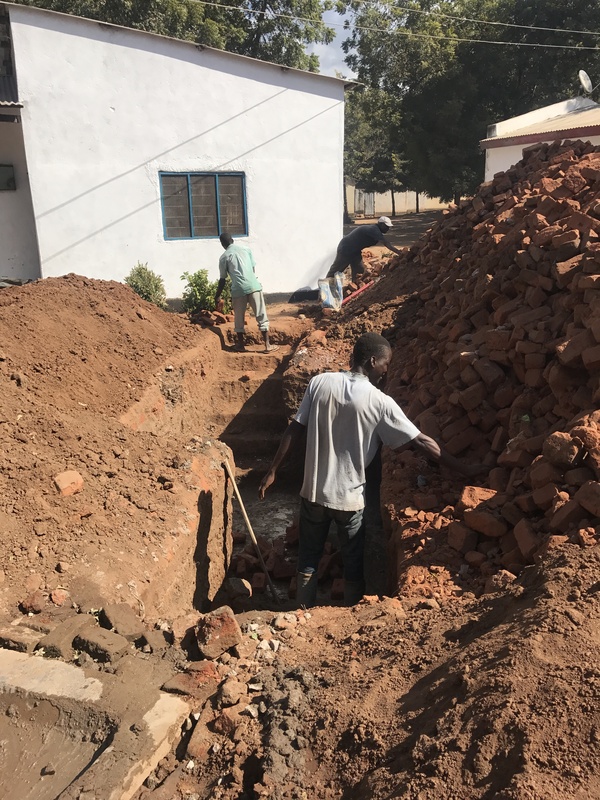 Pastor Chilemba found that the contractor had failed to install a drain! 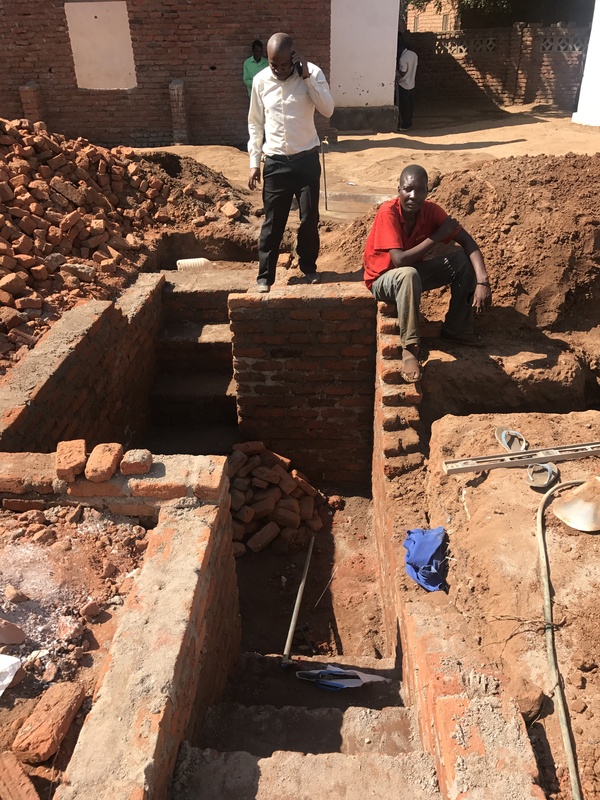 He hired a new contractor, they fixed the problem, and progress continued. Would be done by Saturday? It’s Thursday and it looks like they are ready to apply the finishing concrete. A quick prayer shot up to the Lord every time I walked by. Please, Lord, let it be ready! Many pastors were bringing new believers to be baptized here because they can no longer use the river. Friday afternoon! Baptisms take place on Saturday afternoon. God answers prayer! It’s Friday evening and the baptismal is looking good! It’s beautiful and I can’t wait to be part of Saturday afternoon’s baptismal service. But before that, we have a date with 150 women to tell them how God has adorned them! I will share pictures and comments from the time with the women! After the women, we had the baptismal service. The next two posts will have pictures and comments from that time. Food wan’t an issue when I agreed to go to Nsanje. Charleeda described the one meal a day that we would be served. Lunch. Pastor Chilemba would pick us up and drive us to his home. 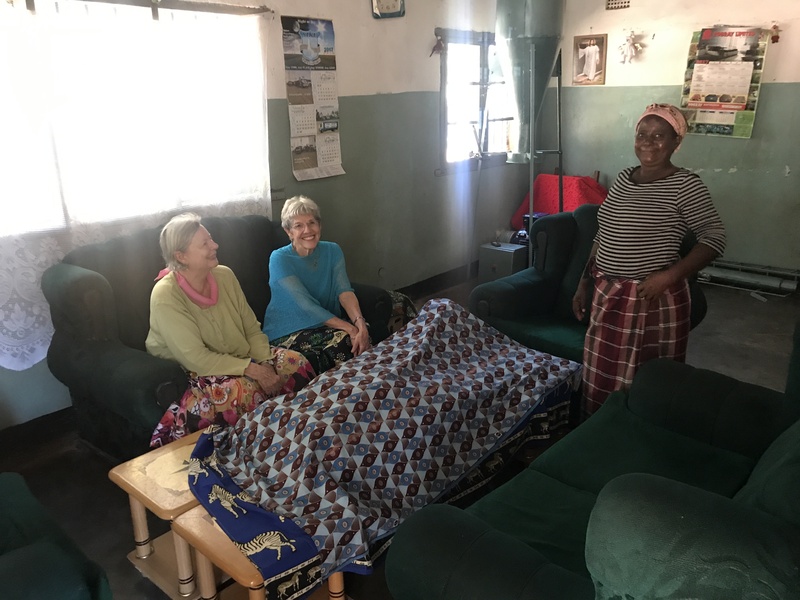 There Mama Chilemba met us and led us into a sitting room with a covered table. She would pour water over our hands and leave us to uncover and enjoy the feast. 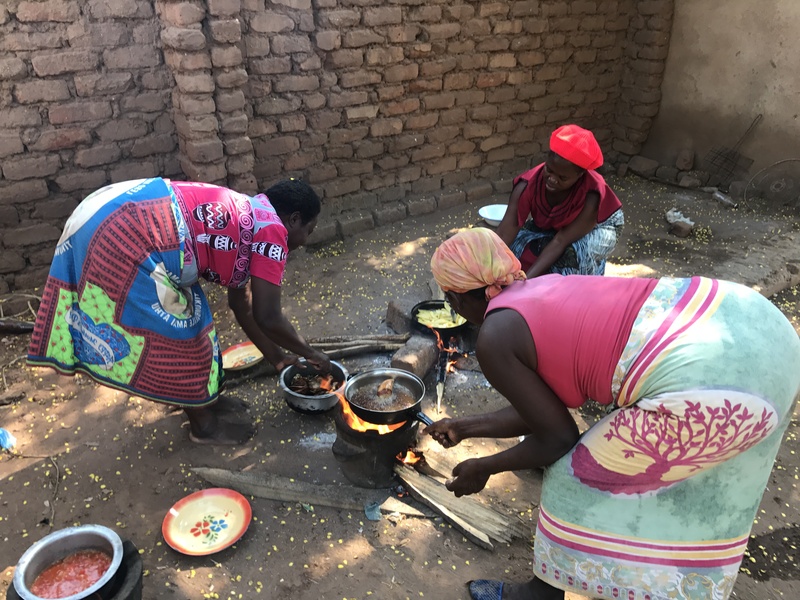 Vicki and Charleeda with Mama Chilemba presenting a lunch feast! Under cover we found chicken quarters, potatoes, rice, vegetables, and a delicious tomato sauce. Only minutes before, the women had been in back of the house preparing our feast. 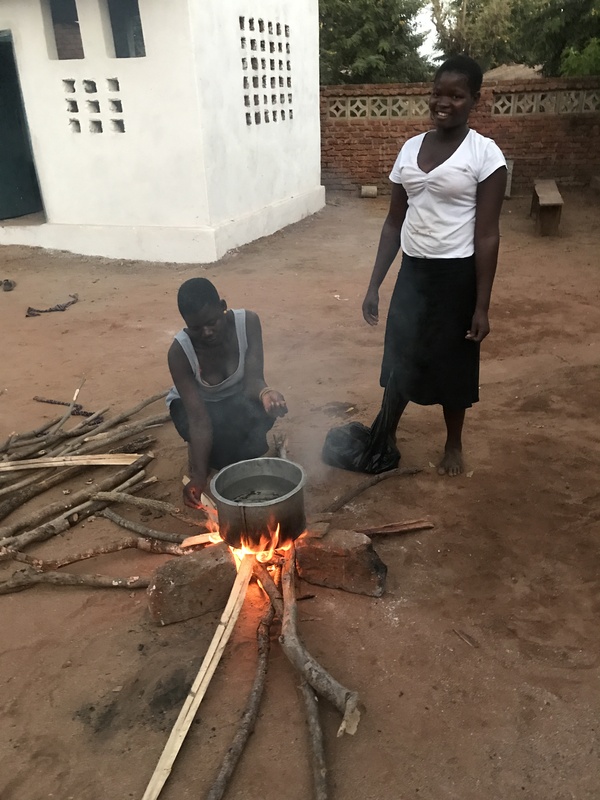 Mama Chilemba and helpers cooking lunch. In the meantime the pastors were also getting lunch. Women start the fires just outside the church building. Getting ready to cook for the pastors. 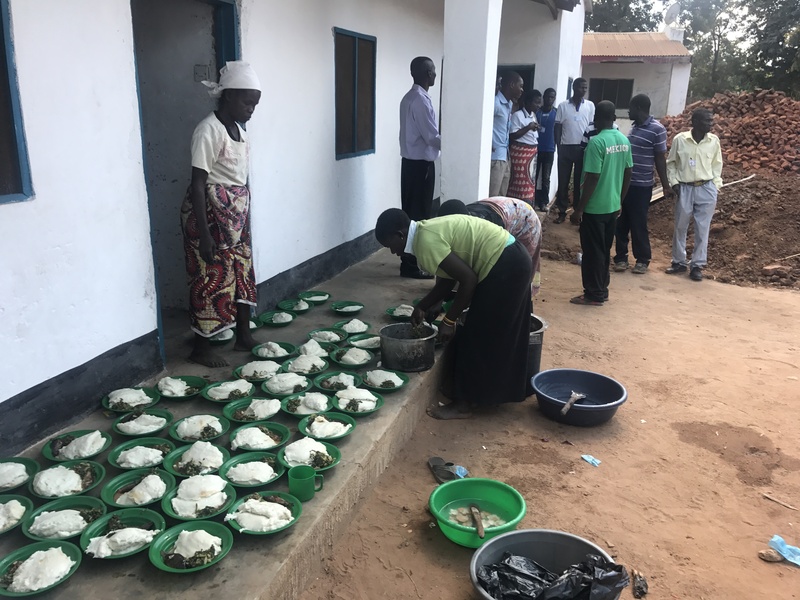 The pastors were served a large portion of maize, some vegetables, and goat. This is the same meal that is being feed to two hundred orphans at the feeding center once a day. 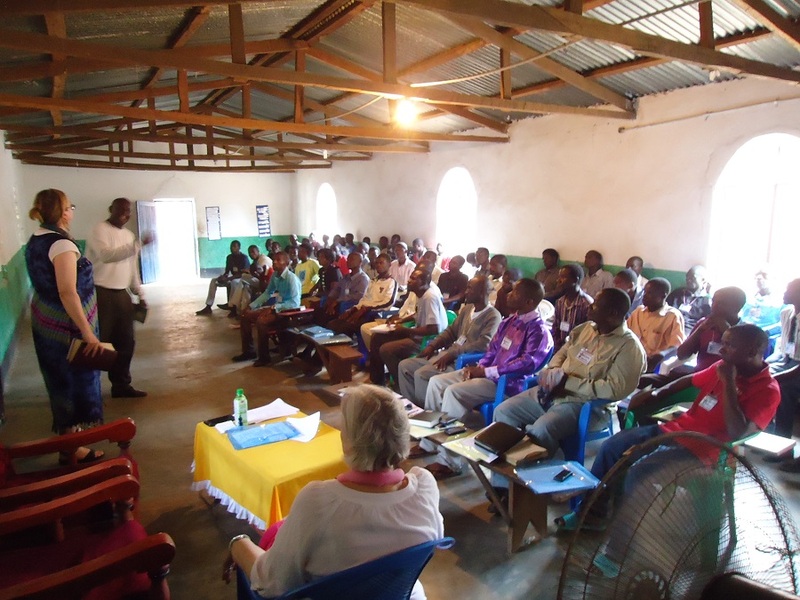 Serving sixty-five pastors on the step outside of the first year classroom. Other than lunch, I lived on protein bars. Charleeda and Mary Beth ate camping meals purchased at Walmart in Colorado. 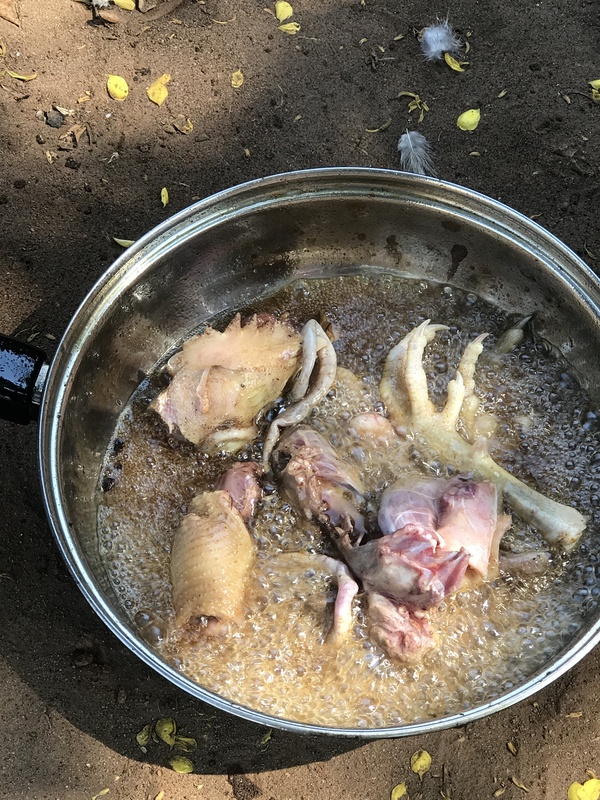 There were no options in Africa, so anything other than lunch we needed to bring. Okay. No day was the same, so the title of the blog is misleading. There were no typical days. That being the case, I invite you to come along and see what happened one day at Bible School. After our general session in the morning, we split into 1st year and 2nd year classes. The first year class was heavily in session with our new translator (Joseph) when a big beautiful black rooster walked in like he owned the place! After looking around to see that we were about our own business, and that there were no chickens there, he walked out the door. This shot barely caught him. Impostor crashes class, loses interest, and leaves. 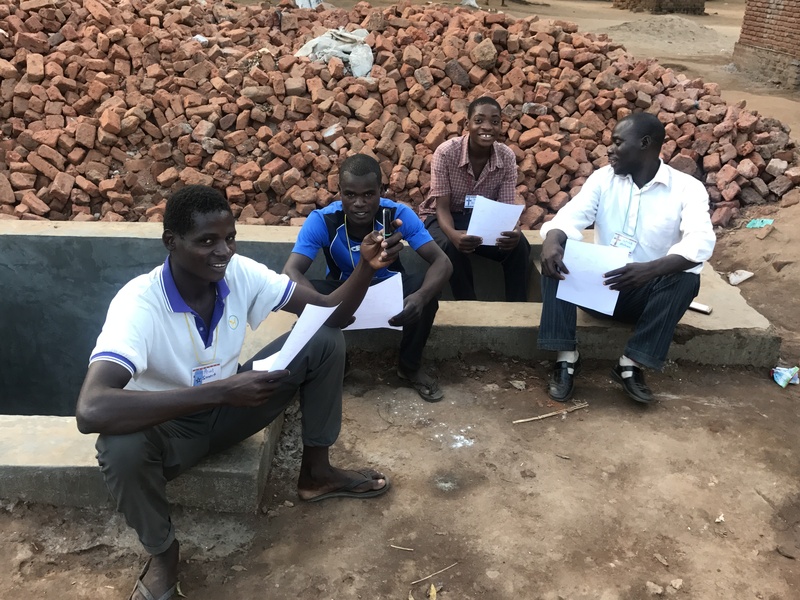 After telling the Bible story, pastors went outside to study the pictures and tell the story to each other. They worked in groups of two or more. 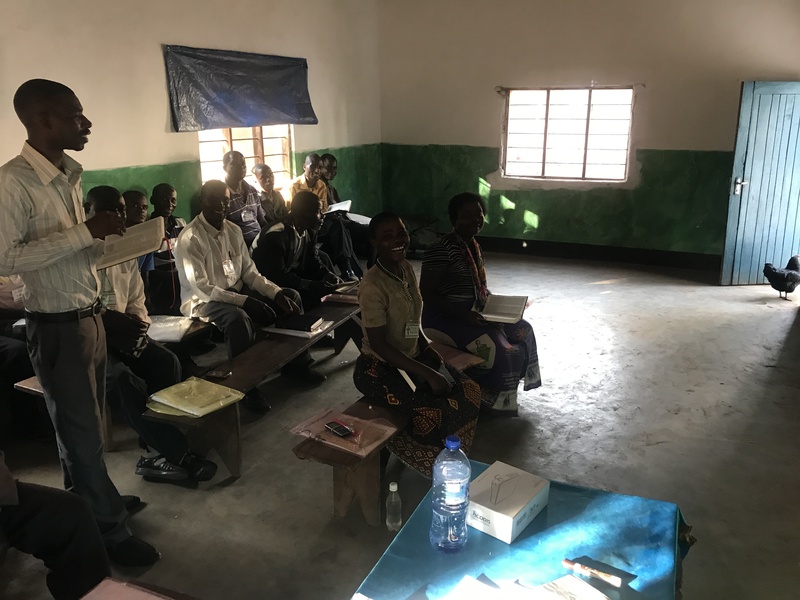 Every day we taught two Bible sessions in the morning after the opening general session and two in the afternoon before the closing general session. Pastors reviewing class story. 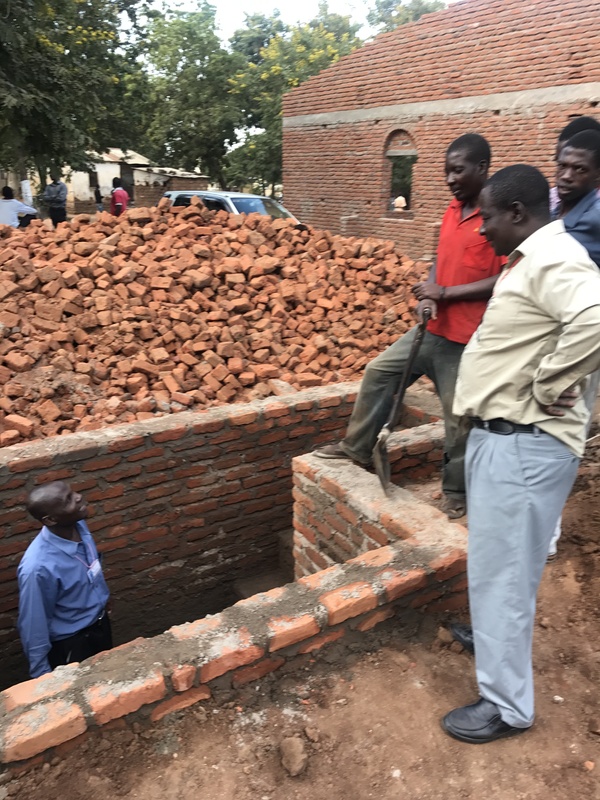 A pile of bricks behind them is for the new church building. 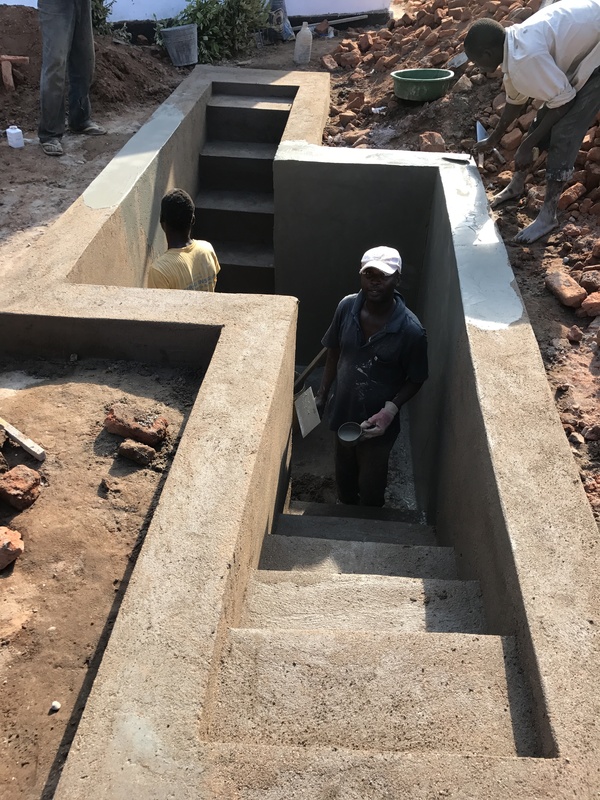 The pastors are sitting on the new baptismal. 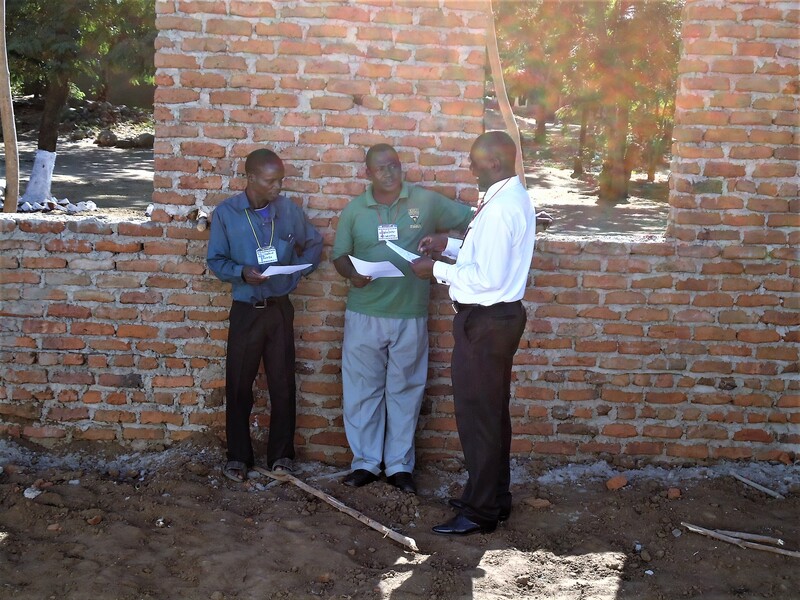 Second year students reviewing in front of wall of new church. In the closing general session, Charleeda brought olive oil from Jerusalem and led the session by anointing each pastor and teaching the passage in James 5:13-16, “Is any among you suffering? Let him pray. Is anyone cheerful? let him sing psalms. Is anyone among you sick? Let him call for the elders of the church, and let them pray over him with oil in the name of the Lord. And the prayer of faith will save the sick, and the Lord will raise him up. And if he has committed sins, he will be forgiven. Confess your trespasses to one another, that you may be healed. The effective, fervent prayer of a righteous man avails much.” Each pastor was presented with a small bottle of anointing oil. 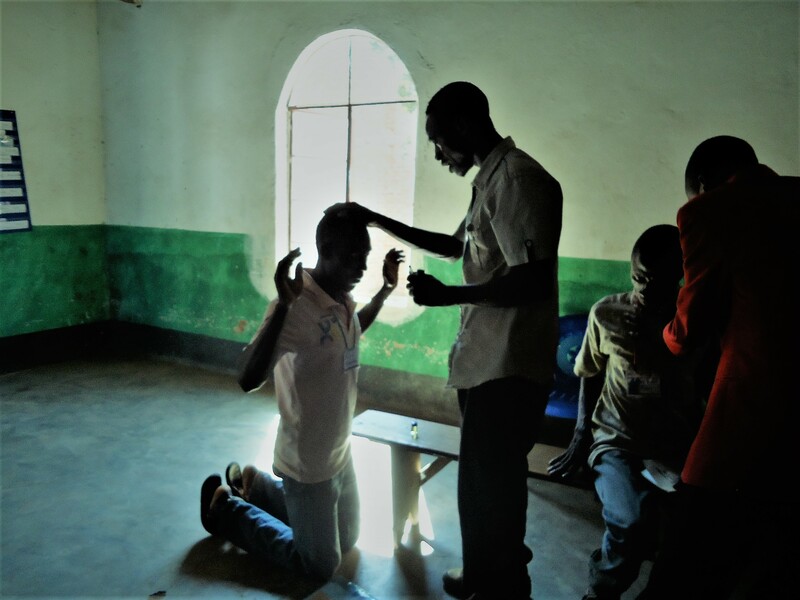 After class, the pastors began anointing each other. Precious time. Precious time after class time in Nsanje. No typical days here. 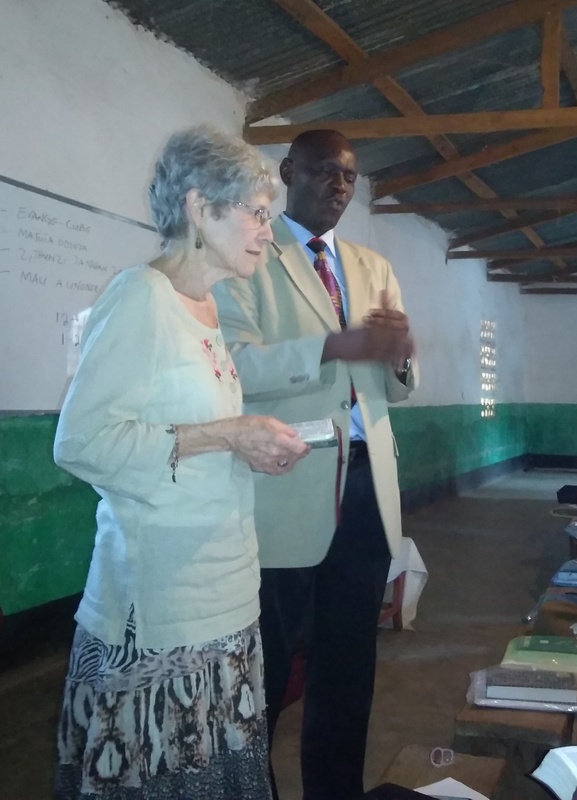 Teaching Bible school in Nsanje required working with translators. 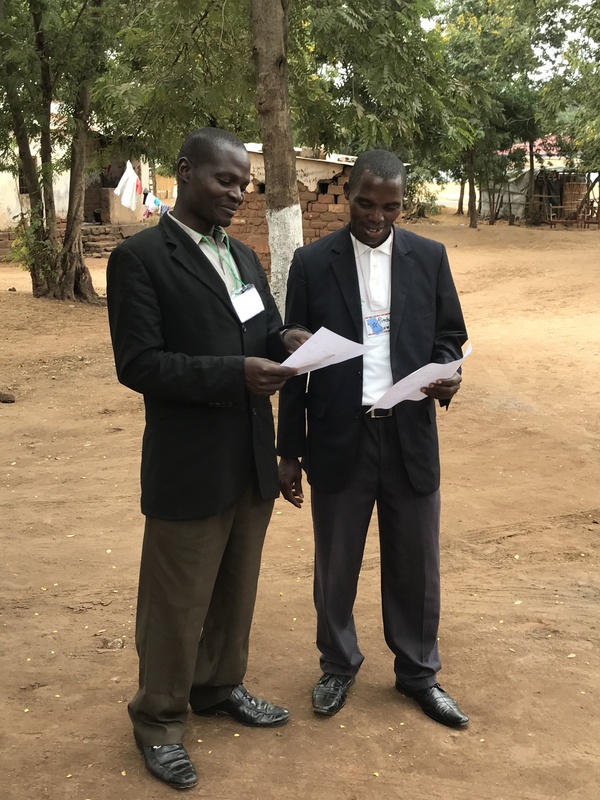 Our team was graced with three pastors who were not only very good at English translation, but very knowledgeable about the Bible – the perfect combination. Pastor Samuel gave energetic translations! He pastors a church down the road from where we were teaching. His wife came to the conference and I was privileged to meet her. They have five children. Charleeda with Pastor Julius translating. The translators helped us not only with the language barrier, but with cultural differences. Only a few times did we need to stop and struggle with word meanings. I do remember one time when we couldn’t settle on how to translate the word ‘intention’ to Chichewa (as in “His [God’s] intentions were good”). 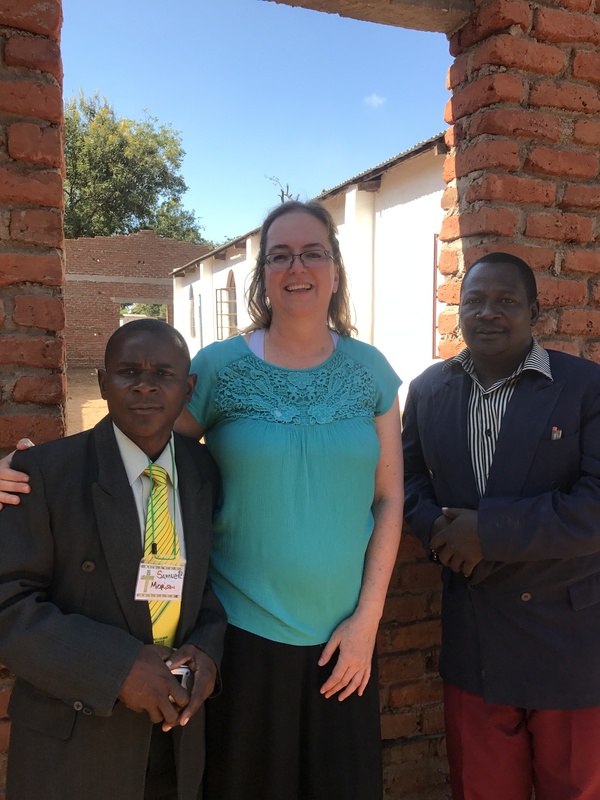 Mary Beth with Pastors Webster and Samuel, two of our translators. Because all of our translators were students in the second year class, they would miss class when they had to translate for the first year class. To remedy that, we found a first year student and drafted him. He is not yet a pastor, but he translated very well! Our first year translator, Joseph. On the day we taught the women, Fiona translated for us. She only translated that day and during a church service. Another very capable translator. Fiona and I at the baptismal service. Every morning Mary Beth and I would meet with Charleeda to take communion. We prayed for the pastors, for the coming events of the day, and for His guidance. At times the Lord would help us pray, as we could not know the future. 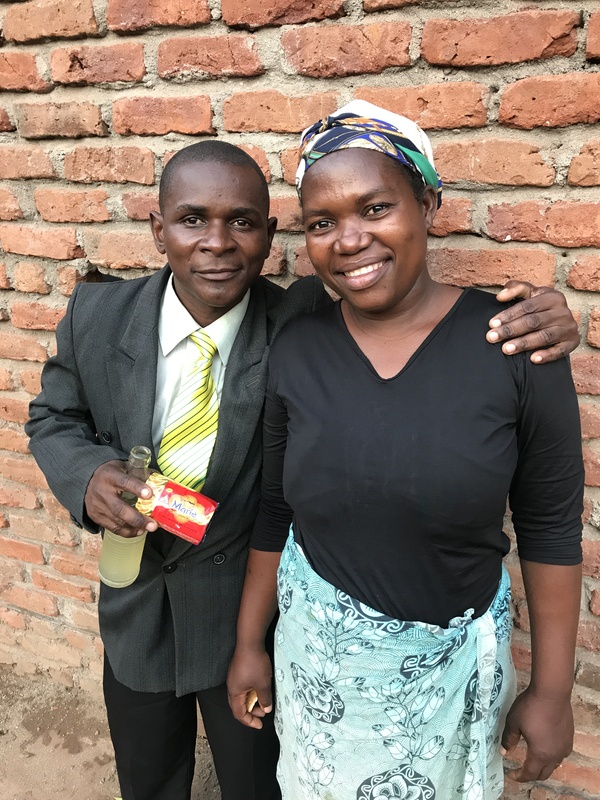 Turns out, teaching Bible School in Nsanje, Malawi, Africa offered many rewards. Mary Beth leading an opening session. Notice the fan. It is nine o’clock! Each day the students began at eight o’clock with praise and prayer. We arrived at nine o’clock and led the general session in a daily affirmation reinforcing the power of the Word, a short message, and then split into 1st and 2nd year classes. 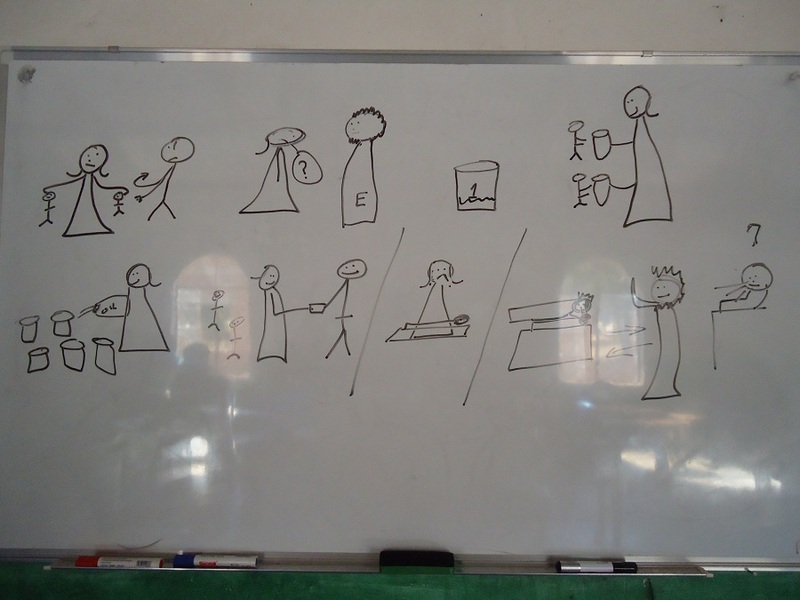 Drawing of the story of Elisha and the woman with only a small amount of oil. 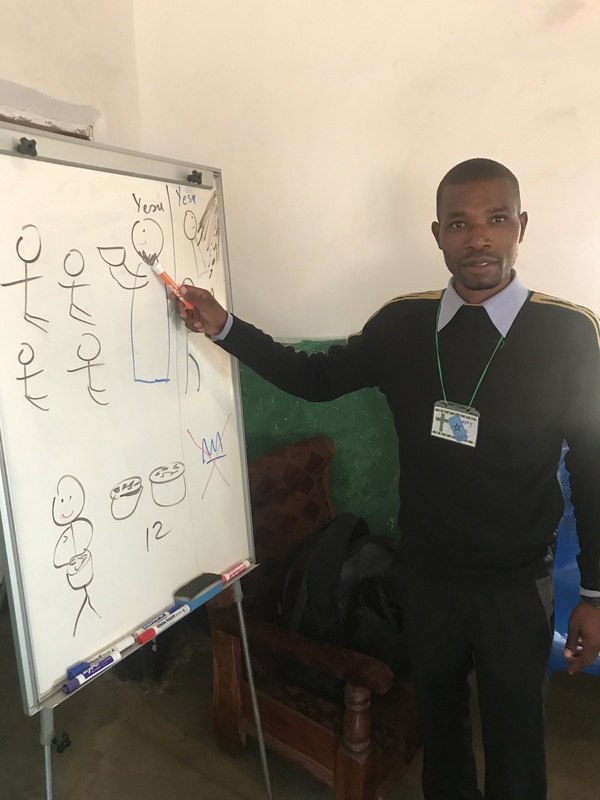 We taught Bible stories by drawing pictures on a white board. 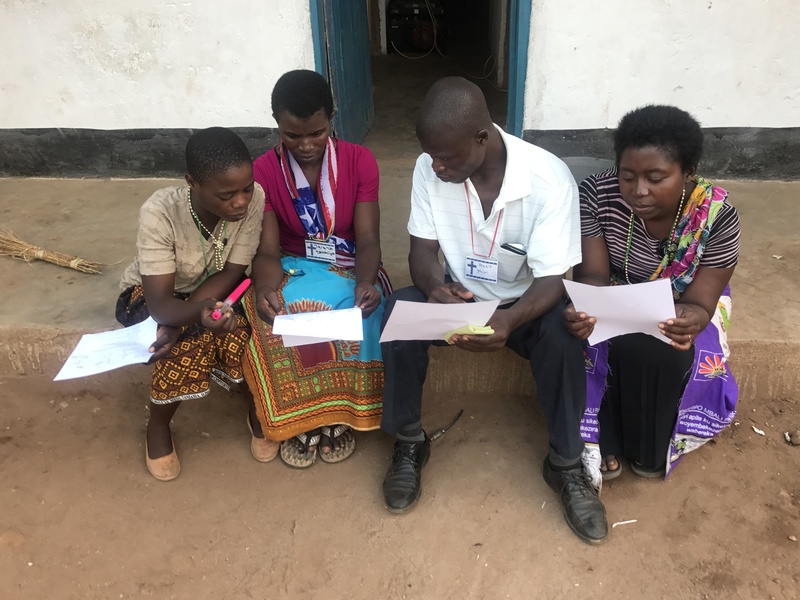 Translators retold the story in Chichewa. Afterward we sent the pastors outside to tell each other the story. They worked in groups of two or more. In fifteen or twenty minutes they would come in and tell us the story. Each class had time for question and answers at the end. Some of the questions surprised us. Suit coats in this weather. It’s hot in Africa! Attending Bible School carries a certain amount of prestige in Nsanje. Many of the pastors dressed in their very best suits and jackets. With temperatures in the 90’s and humidity somewhere at 50% or more (we were blessed with electricity most days) the fan helped. However, I wore 100% cotton and by ten in the morning was soaked with perspiration through and through!